Daylight Saving Time (DST) starts today at 2 a.m. on March 8, 2015 in most parts of the U.S. except in the states of Arizona and Hawaii, and the overseas territories of Puerto Rico, American Samoa, Guam, the Northern Mariana Islands, and the United States Virgin Islands. As clocks "spring forward" one hour, spring is in the air. Hawaii is in the Hawaii-Aleutian Time Zone; Hawaii-Aleutian Standard Time (HST) is equivalent to GMT/UTC - 10h Standard Time. When the United States enacted the Uniform Time Act in 1966, Hawaii opted out in 1967, mainly because there is not a large variation in daylight hours from summer to winter due to Hawaii's proximity to the Equator. The Territorial Legislature enacted a bill placing Hawaii on daylight saving time in 1933, but the law was repealed three weeks later. According to Wikepedia, during World War II between February 9, 1942 and September 30, 1945, Hawaiian Standard Time was advanced one hour to so-called "Hawaiian War Time." That was the only period when Hawaii was effectively placed on year-round daylight saving time. 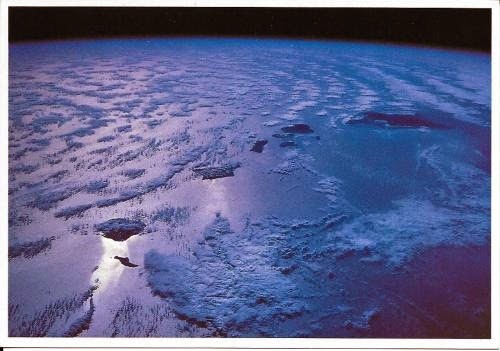 Postcard US-3230216 from California shows a NASA image of the entire Hawaiian Island chain as seen from the Space Shuttle. Niihau and Kauai are in the foreground followed by Oahu, Molokai, Lanai and Maui, with the Big island in the distance. The curve of the Earth and the black of outer space can be seen on the top of the card.